that their parents let them roam freely in the car while traveling to the veterinarian. While this may seem like the most humane solution, it actually puts you and your cat in danger. Even a minor fender-bender can toss a seven-pound cat around quite around quite a bit. Not to mention what would happen if your curious kitty were to wedge herself under the brake pedal. into the carrier 15 minutes before scooting her inside can trick her into being comforted. You can find them online. Leaving the carrier out when its not in use will make it a familiar object in her daily life. Instead of hiding it in a closet, leave it somewhere accessible so she’ll be able to smell it, explore it, and mark it with her happy facial pheromones. when she’s rubbing against the carrier, showing curiosity towards it, or voluntarily entering it will help her associate the experience with a happy time.
. Cats are sensitive and finicky creatures, and choosing the right carrier can make a huge difference in how your cat reacts to it. Size is one of the most important factors to consider when you’re choosing a new carrier. In this case, bigger isn’t always better. 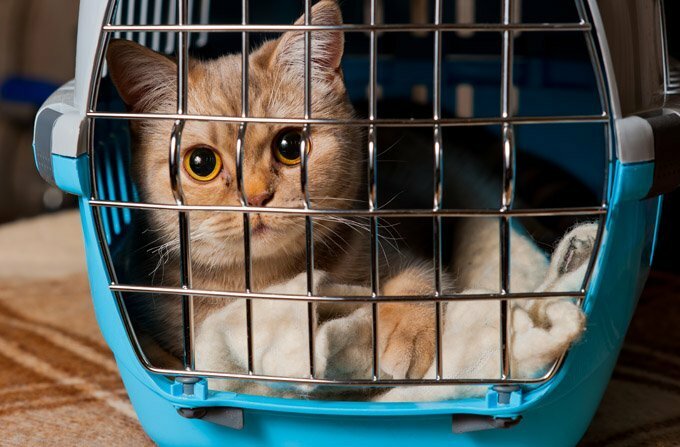 If your cat’s carrier is too small, she’ll feel cramped and uncomfortable, which can exaggerate the already stressful experience of traveling. On the other hand, choosing a carrier that is too large can cause your cat to slide around and feel unsafe. So how do you know what the correct size is? According to experts, an appropriate sized carrier is 1.5 times the size of your cat. This should give your cat enough room to stretch but not enough to be knocked around. When you are searching for a carrier you’ll notice many different types of soft and hard options. For many cats, the material won’t matter much. However, you may want to choose a hard plastic carrier if your cat is prone to scratching when anxious. Otherwise you may find yourself replacing a shredded soft carrier more than necessary. If you choose a hard carrier, be sure to line the bottom with a soft layer so your cat will be comfortable. Many carriers these days are adorned with loops that will allow you to secure it with a seat-belt in the back seat of your car. Just think of how much safer your cat will be in the case of an accident if she is secured. rather than in the front. If your cat isn’t prone to flailing, you may do just fine without this feature. Unfortunately, there isn’t one type of carrier that is “the best” for every cat. Each cat will have her own quirks and preferences and only you will be able to determine what may work best for your specific situation and cat. Let your knowledge about your individual cat, along with these suggestions, guide you towards a conscious and informed decision about the type of carrier that will work best for her.